The Academy Awards were Sunday, but these local students were the focus of paparazzi on the red carpet last week. 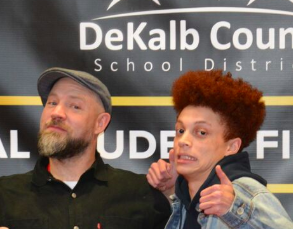 Students from two DeKalb schools were the big winners at the first “DeKalb Student Film Festival” on Thursday, February 21, bringing home awards in the ““Best of Show” and “Audience Choice” categories. The DeKalb School of the Arts was named the “Overall Winner” for their film, “Locked Out.” The DeKalb Entertainment Commission (DEC) partnered with the DeKalb County School District for this first-ever film festival highlighting student productions. A total of 33 films were submitted from 13 high schools and one middle school as part of DeKalb County School District’s AV and Film Program. Participating High Schools: Arabia Mountain, Chamblee, Columbia, DeKalb High School of Technology South, DeKalb School of the Arts, Dunwoody, Lakeside, Miller Grove, McNair, Southwest DeKalb, Stephenson, Towers and Tucker. Participating Middle School: Tucker Middle. The judges for the festival included: Mark Ashworth, actor; Matthew Cornwell and Eric Goins, (SAG-AFTRA); Jessica Fox-Thigpen, Fox Casting; Bobby Huntley, director; Jason MacDonald, Drama Inc. acting studio; Justin O’Neal Miller, Alchemy Set, production company; Angela Ray, actress; Barry Stoltze, actor; Scott Thigpen and Maggie Mock, Crazy Legs Productions. The event was also in partnership with re:imagine/ATL.